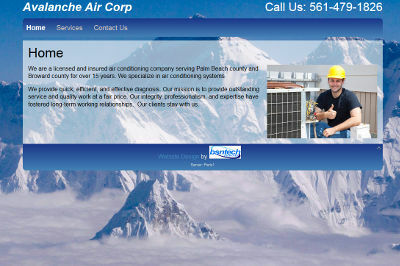 John, the owner of Avalanche Air Corp, placed an order on our website last week to have a website design created for his heating and air conditioning business. Upon getting the information from John, we worked right away with his website. Within less than 24 hours upon receiving his information, the website was up and ready for his review. John took one look at the site and said that it was “great and straight forward”. We appreciate the business from John and look forward to any other work from him and any referrals! The Avalanche Air Corp website is at avalancheaircorp.com.